A few weeks ago I started a new novel. It’s off to a slow start, for several reasons. For one thing, I’m still trying to decide whether to write it in “reflective present tense” or past tense—I’m leaning towards past tense now. And although I’ve got the complete story in my head, including the ending, I’ve still got some things to work out about the structure. Having revised my first novel MANY times, I’m hoping to get a better start on this one, even if takes a while to get out of the gate. One thing that helps me when I’m writing is reading books by authors I admire, or who write to what I believe to be a similar audience. 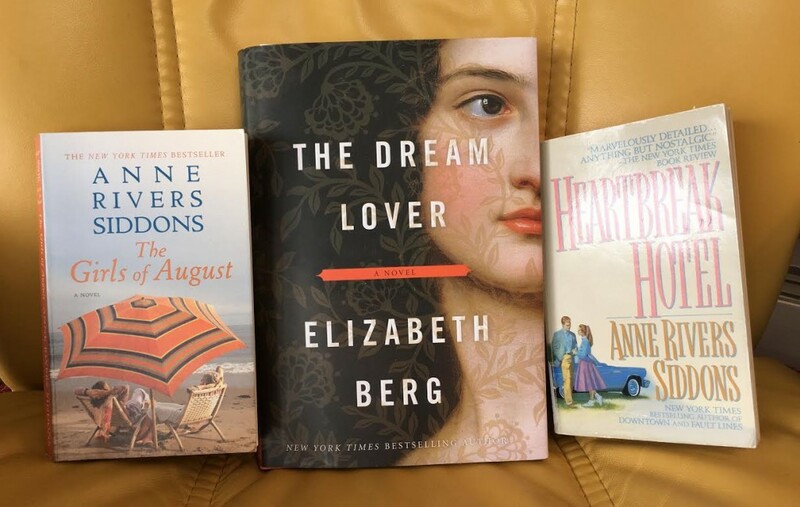 I’ve just finished two (quick reads) that fit the bill—Anne Rivers Siddons’ Heartbreak Hotel (1976) and The Girls of August (2014). Although both are character-driven in many ways (which I try to do with my fiction) they are also both page-turners. The relationships between the women in The Girls of August remind me very much of two other favorite books, Cassandra King’s The Same Sweet Girls and Lee Smith’s The Last Girls. Fun to read, and written straight to the heart, The Girls of August is inspiring my new novel, which will also focus primarily on women’s friendships, and is set in a coastal town. But now I’m reading Elizabeth Berg’s historical novel, The Dream Lover (2015). I’m blown away by her prose, as well as the authority with which she uses historic details and settings. I’m sure she spent many hours on research, as much of the book is set in 19th century Paris, and involves the life of the writer, Aurore Dupin, who writes mostly under the pen name of George Sand. Her friends and lovers include Frederic Chopin, Gustave Flaubert, Franz Liszt, Victor Hugo, Marie Dorval and more. Berg wrote the book because she wanted to read a novel about George Sand and found that none existed. As I read I find myself thinking, over and over, “I want to write a book like this.” And I’m still thinking about it, although I haven’t found my heroine yet. And I’m not sure I’m ready to dive into that level of research right now. Maybe later. For now, I think I’ll follow the lives of those southern women on the Gulf coast, remaining in familiar territory, writing about “what I know.” But I could always change my mind. Stay tuned.